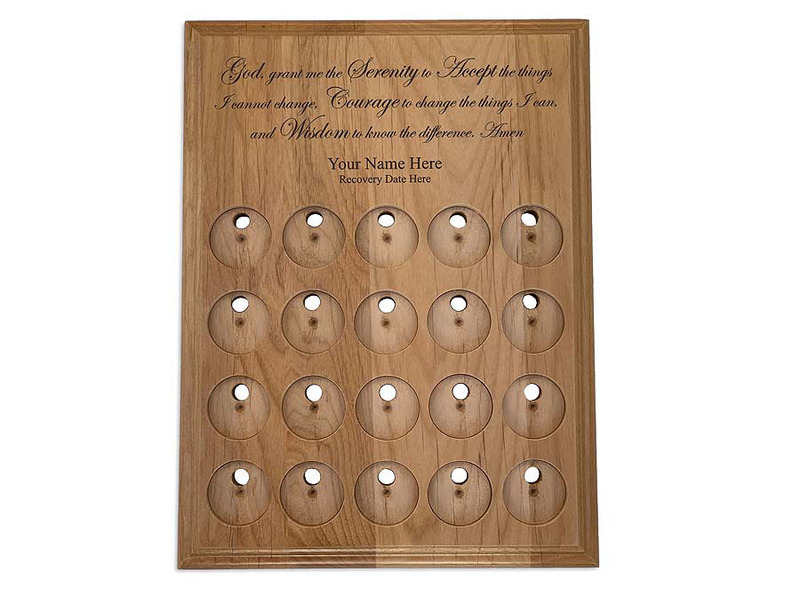 After many requests, we are pleased to offer this lovely, TWENTY Token Personalized Recovery Medallion Display Plaque. It features our Serenity Prayer and slots for 20 of your favorite recovery medallions. Each display is personalized with a NAME and a recovery DATE. A keyhole on the back side of each medallion display plaque makes it simple to mount on the wall, door, or any flat surface. And because we drill a hole entirely through each medallion holder pocket, it's easy to change out your medallions whenever you wish. Just pop 'em out and mount the new ones with double sided tape! Use you imagination with the text fields! We can accommodate your name, group name, recovery date, event theme, facility name, etc. Contact us for additional laser engraving ideas!